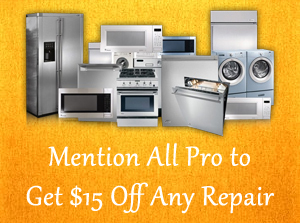 Welcome to the website of Low Rates Appliance Repair. All of our technicians are highly trained and licensed. They carry a large inventory of parts on their trucks, so most of the jobs are done right after diagnosing the problem. Call us before you spend a dime on your repair, we are ready to take your call. My name is Michael Penrod. My oven went out one weekend morning and I called Low Rate Appliance Repair. By the afternoon the technician arrived at my home, diagnosed the problem, pulled the defective part, had the replacement part in his service vehicle and made the necessary repair within an hour. I was cooking that afternoon. LRAR service was very professional. Our refrigerator was making a clicking sound and not cooling anything. We got in touch with Russ from All Pro late on a Wednesday, and he was able to come out the next day. Diagnosed the problem, explained what was wrong and gave us our options, then fixed it quickly for a reasonable price and a fraction of the cost of a new fridge. Would definitely recommend and use again. Thank you Low rates.My Maytag washer stopped workig half way through the washing cycle,so I called this company around 11pm I wasn't plan to talk to anyone.I was very suprised when a dispetcher from Low Rates answered the phone,answered all my questions and booked an oppotment for me first thing in the mornig. Next morning my washer was fixed by them. I spend $95 and have my appliance working like new.